Setting up a reptile or lizard cage requires that an owner simulates the type of environment the lizard would have experienced in the wild. These are also referred to as lizard vivariums, terrariums or habits. Some owners prefer a simple home made cage or one that is sparsely decorated, while others like to replicate the native environment of the lizard. New hobbyists can get a fast start by purchasing a kit such as the one pictured below. Native Environment: Latitude and elevational range where your species of gecko is from. This will dictate how the terrarium is designed. Temperature: The lizard body temperatures is set by the outside temperature. Most lizard habits require a heated area for basking, such as a flat rock and a cooler daytime area that is often adjusted an additional 10 to 15 degrees colder at night. Lighting: Lizard need vitamin D to metabolize calcium. This comes from either exposure to natural light or approximatley 10 hours of light provided by a UVB bulb. Lizard Cage: Reptile cages are measured in gallons, in square feet and in side x side x height dimensions. The reptile cage needs to accommodate the size of the lizard and the type of environment required. For example, some lizards like to burrow, others hide, and still others climb. Water and Humidity: Lizards require a humidity level between 30% and 70%. Semi-aquatic lizards require higher humidity while desert lizards are on the low end of the scale. Lizard and reptile cage materials will vary based on whether you need to keep humidity in the cage (glass, plexiglass) or wire mesh (be careful with dimensions so that lizard does not get caught in the mesh). Reptile Cage Furniture: Pet stores sell a wide variety of furnishings. 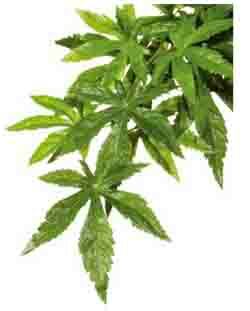 These include flat rocks, substrates (material for bottom of cage), branches and more. Note that the cage will need to be cleaned frequently, and substrates will need to be replaced every 3 months, so keep this in mind as you select decorative items. Use the search box on this page to find infomation on the natural habitat of your lizard breed or our lizard list. Savannah Lizards: Environments that transition from one type to another, such as at the edge of a desert, woodland or acquatic area. Lizard Cages: The design of the cage reflects the size and needs of the lizard. A Gecko can thrive in a 10 gallon acquarium, although a 15 to 20 gallon size is better, Species that live in trees require vertical and horizontal branches, while others like to dig or burrow. A larger lizard, such as an adult bearded dragon requires a 75 gallon aquarium (238L), although an even larger habitat is preferred. These lizares also require a screen top for ventalization, a rock cave for hiding, and branches for basking (see descriptions of these items below. Most lizards do not like to be housed with others, particularly males. Lizard cages can be home made or purchased from a pet store. Exo Terra Allglass Acquarium for Lizards. Available in multiple sizes as shown here. Lizard Temperature: Lizards are cold blooded. They change the temperature of their bodies by moving to different areas of the aquarium. They typical lizard will need a heated area for basking, and then a colder area for cooling down. When the lizard reaches the required temperature, other areas allow them to cool off. If the lizard is from tropical areas, temperatures usually range between 80 to 100F (27 to 38C). Temparate lizards are kept in temperatures sfrom 68 to 95F (20 to 35C). Again research the suggested temperatures for your lizard specie. Do not overheat any surfaces and keep heat lamps at least 18 inches, but can be several feet from the lizard. Heat sources include undertank heater which should be placed under no more than 30% of the lizard cage bottom and heat lamps. Many owners prefer Mecury Vapor lights such as the Power Sun, since they provide the required heat and some UV light. UV light provides many of the benefits of natural sunlight and is critical to lizard health. Other options are infrared heaters which attach to the top of the acquarium. The advantage of infrared such as the ZooMed Repticare Ceramic Heat Emitter is that they do not overheat the basking area and do not emit light. A minimum habitat temperature can be set 24 hours a day wiht the use of a floor heat mat. 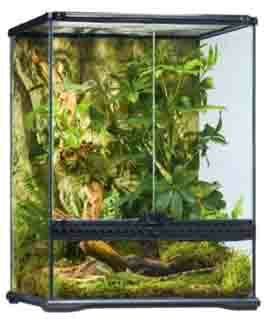 Lizard and Reptile Cage Substrates: The habitat floor can be covered by a variety of materials. Some prefer simpler choices such as recycled newspaper or wrapping paper. Redwood bark and cypress mulch in particular are lizard and owner favorites for their appearance and the way lizards take to the substrate. An alternative is to use a product made for lizard cage floors called a Repticarpet. Aquarium for Lizards Lighting: Every owner should learn the photoperiod or number of hours of continuous light needed for a particular lizard. The number of hours will vary based on time of year with many lizards requiring 10 hours of light in winter and 14 hours in the summer.There are two types of lights used in an aquarium for lizards. The first is a UV or ultraviolet light and the second is a Basking light for heat. UV Lizard Lights: These lights have many health and behavior benefits for lizards (also called UVB), including skin health. Bulb choices include flourescent light and the Power Sun type Mercury Vapor bulps mentioned above. The light wavelengths are referred to as between between 290 and 320 nanometers. Basking Lights are 50 to 75 watts and should be kept at least 18 inches from the lizard (in a location that cannot come in contact with the lizard, such as outside the cage). Light that naturally comes through windiows or the side of a tank is not adequate since the UV rays are filtered out. If a lizard does not get enough sunlight, a vitamin D supplement may be necessary. Humidity and Water Levels in an Aquarium for Lizards: Required water and humidity levels depend on the lizards species. For example, lizards from the desert are genetically able to conserve water while others such as as those from semiaquatic environments need to spend a signficant amount of time in the water, and may even eat in the water. Many types of smaller lizards such as Anoles drink from water droplets on leaves, while others are comfortable drinking from a water dish. If humidity is too low for a particular lizard (under 30%), the skin can become too dry, resulting in shedding. Too much humidity can leads to lizard health issues such as skin infections (+75% humidity). Lizard Cage Furniture: Reptile cages do not have to be ornately decorated. Many hobbyists in the United States prefer simple designs, opting to keep smaller lizards such as Geckos in simple plastic boxes, using paper as a floor substrate. In Europe, hobbyists opt to create an entire ecosystem in the terrarium. The answer is to which is best is based on personal preference and the needs of the lizard. 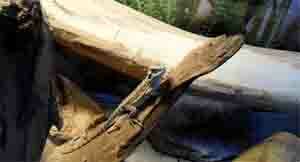 Lizard Hide Boxes: This is where the lizard can have some privacy. A popular option is a box where the lizard feels like it is hiding, but is carved out on the side for owner observation. Hide boxes can be home made (plastic cat litter boxes) or store bought as the one pictured below. A home made hiding box could be as simple as a shoebox. 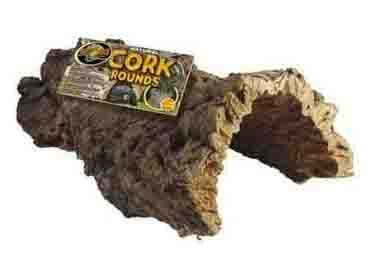 Cork Bark: Cork bark is a material that can be used to decorate lizard cage backgrounds or as a place to climb and hide. Lizard Tree Limbs: As mentioned above, lizards require an area under a heat lamp or light to bask or warm. This can be on top of a limb or on a flat rock depending on the preference of the species. For comfortable basking, the limb width should be at least the size of the lizards body. Lizard Cage Limb for Basking. The limb should be as wide as the lizard. Lizard Cage Foliage: Planting in cages provides additional security for the lizard as they can use the foliage to hide from view. Suggested plants include F. ben jamina Dracaena are popular. 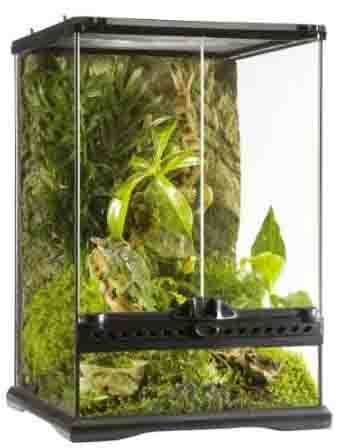 Plastic or silk terrarium plants provide another option. Plants can be kept in their pots and then buried into the substrate. Avoid live plants that produce sap or that have pricks. Plants require light such as full specturm flourescent lamps. Lizard Cage Silk Decorative Plants like this one replicate natural plants and provide additional hiding places for the Reptile. 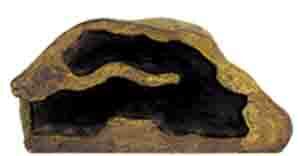 Lizard Cage Rocks: A cage for lizards often includes rocks that mimic those found in the lizard's natural environment. Rocks are used as a vantage point and for hiding. Use a silicon adhesive to hold rocks in place. Rocks are made from materials that mimic the real thing when used in a home terrarium. If you place rocks on top of a substrate such as sand, make sure that small lizards such as Geckos cannot burrow and get trapped underneath. For example, silicon rocks can be set into place with silicone. Make sure any silicone used has dried and is not emiting any more fumes that could harm the lizard. To keep the lizard healthy, any lizard cage should be kept clean. This means that feces is removed, urine is cleaned, and any food is not allowed to spoil. If feces is not removed, parasites can become a health threat to the lizard. Remove any feces at least 1x or 2x per week. Any substrate or product used to cover the bottom of an acquarium should be changed every 3 months. The entire terrarium should be completely disinfected. Clean and disinfect water dishes at least 1x per week to avoid bacteria. Do not wash lizard items in areas where food is prepared to avoid salmonella. Note that even products made for lizard cages sich as Wipe Out requires that the lizard be removed prior to cleaning.